Successful coaching was the McConnell trademark. 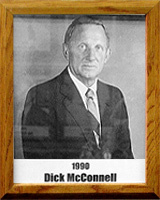 His career coaching record over 32 years was 417-174. As boys’ varsity basketball coach at Sahuaro High School, he took the team to state playoff tournaments 13 times. His teams were finalists three times, won state titles in 1970 and 1982 and finished as semi-finalists on numerous occasions. McConnell ranks fourth on the all-time Arizona win list. He is a member of the Washburn University Athletic Hall of Fame and the Arizona Coaches Association Hall of Fame. He is considered one of the most knowledgeable, astute coaches in the state.